SAN NARCISO, Calif. (Bennington Vale Evening Transcript) -- On March 13, Facebook CEO Mark Zuckerberg phoned President Obama to voice his extreme displeasure over the U.S. government’s domestic spying programs, which were revealed to the public through leaks from former intelligence contractor Edward Snowden. “The President spoke last night with Mark Zuckerberg about recent reports in the press about alleged activities by the U.S. intelligence community,” a White House official said Friday. But by Monday, the 29-year-old tech billionaire showed no signs of being placated. Zuckerberg told reporters the NSA could monopolize all social media companies within days of launching its own network. He urged the Justice Department to file antitrust charges against the NSA for unfair competition. “I’ve called President Obama to express my frustration over the damage the government is creating for all of our future. Unfortunately, it seems like it will take a very long time for true full reform,” Zuckerberg complained. According to Zuckerberg, the damage could be catastrophic to all companies in the social media sector -- not just Facebook. He praised the efforts of his engineers who have worked tirelessly to pilfer personal information from millions of users and sell it to marketers for outrageous profits using all legal means available. But the NSA, he stated, had not demonstrated the same level of ethics. Representatives for the NSA called Zuckerberg a “spoiled crybaby who’s being nudged from his lofty pedestal for the first time in his entitled life.” They pointed to thousands of congressional documents that grant the agency legal authority to conduct electronic surveillance on every American with a phone or computer. “Facebook can whine all it wants, but we have the same legal protections in place for the American consumer, and our materials are freaking laws...a helluva lot more in-depth than some clunky EULA,” Director of National Intelligence James Clapper shot back. 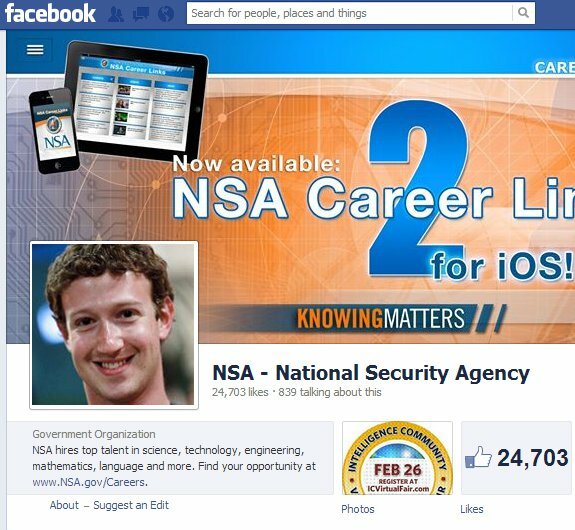 Because the NSA is backed by tax dollars and the federal government, it also requires less reliance on advertising revenues than Facebook. But Clapper implied that with the unprecedented trove of personal data the NSA has already mined from billions of users, it could revolutionize the targeted marketing campaigns Google and Facebook still struggle to evolve. Clapper also blamed Zuckerberg’s “over-the-top” antics on a bruised ego.